Good news in the month of March…you don’t have to be Irish to celebrate St. Patrick’s Day, coming soon! Teachers in many communities well outside of Ireland turn the best known symbols of “Paddy’s Day” – shamrocks and leprechauns – into icons for learning. Take, for example, the Lucky Leprechauns Bulletin Board full of young children’s poetry in my blog pic below. These poems have been pre-formatted to allow kids in early grades to complete partly written poetic phrases and in the process achieve some success with creating rhyme. 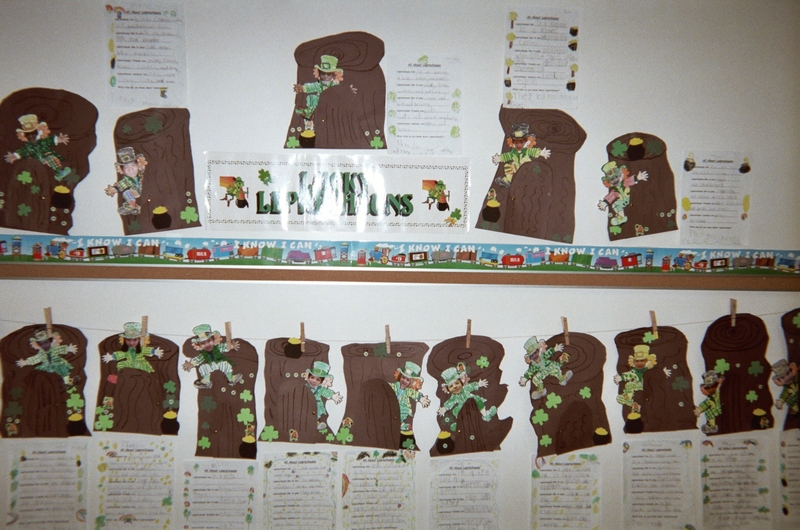 A Lucky Leprechauns Bulletin Board works well for older elementary students, too. Post an age-appropriate heading and invite your kids to do some research into the history of leprechauns before asking them to write poems or stories based on the luck of the funny creatures. As your class will discover through research (or your own storytelling – you can use this blog as a guide), the luck of a leprechaun is no luck at all…but rather the result of “good old-fashioned” hard work. Irish myths have long told a story that you may already know: Leprechauns are “believed” to be male fairies that take the form of little old men who live on the island of Ireland. They love to make mischief (something children always seem to enjoy!) As legend tells, leprechauns are very rich from constructing their many crafts. But, if one’s caught he must tell the truth about where his fortune lies. The leprechaun may be truthful but he’ll use his wit to protect his treasure. Well, as you can likely tell, the legend of the leprechaun seems to have been used from one generation to the next as a story to model good behavior in children…follow the leprechaun’s lifestyle…work hard, be thrifty, tell the truth but protect the fruits of your labor. Following in the leprechaun’s storied tradition, post an attention-getting Story Starter on the board for your class (recommended for grades 2 – 5) to use between now and “the wearin’ ‘o the green.” The Story Starter…The Harder I Work, the Luckier I Get! Spend some time with your class brainstorming ideas for stories with that title. Ask if hard work really leads to good luck. What type of work makes someone feel lucky? Decorate a bulletin board inside your classroom or in a nearby hall with shamrocks or leprechauns and post age-appropriate math challenges or problems with a headline that reads: Lucky Numbers Need Winning Answers! Set out a green box to collect student answers. Reward kids who submit correct entries with shamrock coins (plastic green coins are available in many dollar stores along with other St. Patrick’s Day decorations). Post a bulletin board headline that reads: Say it with Signs and Symbols! Below the headline post symbols that may (or may not) be familiar to your students – a shamrock, a globe, a handicapped access sign, a heart, a four-leaf clover, a blue ribbon, and any other symbols that connect with your community and culture. Tape a sheet of lined paper underneath each symbol and invite students to write what they think the symbols represent. A Say It with Signs and Symbols Bulletin Board is an eye-catching way to offer a lesson about the power and importance of communication. Lead a conversation with your third, fourth or fifth grade class about the many ways we can communicate. Make the point that the better we know how to communicate, the better we can get along in the world today. Continue the discussion by pointing out that most of us have the ability to speak with words in our native language. During your signs, symbols, communication lesson, ask for a show of hands (even if you already know the answer) of how many students in your class have the benefit of knowing more than one language. Challenge your class to name the tactile language (Braille) that people with blindness use. Ahead of lesson-time, research (if you don’t already know) sign language so that you can show a few examples of how people who are hearing-impaired may communicate. Ask your class to follow your demonstration by using sign language themselves. Close the lesson by holding up a poster (I’ve seen this poster in many schools where I teach and you may find it online) that reads something to the effect – a smile is a language that everyone understands! ‹ Sometimes Big is Better!